We are in a rural location, 4 miles to the east of Colchester and 2 miles from the University. 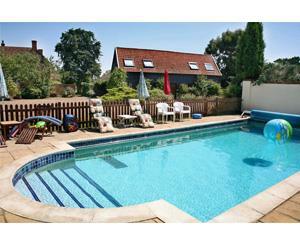 Our five cottages have either one, two or three bedrooms. Four are on ground level and surround a central courtyard. The remaining cottage is in the main barn over two levels. Each cottage has a fully equipped open plan lounge, kitchen and dining area. The bathroom has a bath with over bath shower. All rooms have thermostatically controlled electric heating. All bedding and towels are provided; however, please bring your own towels for swimming pool. The swimming pool is enclosed by a fence and is seasonally heated from the end of May until the first week of September. Wi-Fi is included in the cost of your stay. Cots & high chairs can also be requested, free of charge. In the main barn is the reception area, where you can find local information and access the laundry, which is equipped with a coin operated washing machine and tumble dryer. Located on the first floor is the games room. Ample parking is available in the guest car park. Birds Farm is open all year and short breaks may be available outside the peak season. no smoking Outdoor Heated Swimming Pool Children welcome from any age. From Colchester, follow A133 towards Clacton. In Elmstead Market, go past the petrol station, then turn right into School Road, keeping Budgens on your left. After approximately 1 mile at a Y junction, turn right into a small lane. Bird's Farm is on the right.